I would guess that virtually no one had heard of Tale of Verve until the Wednesday before the Kentucky Derby. That’s when entries were due for that race, and this horse was a shocking entrant in the race. No one had seen him coming. He was the 22nd horse on the list, and only 20 could run. There were scratches, but they came too late, and he was left out of that field. Instead of looking for what would appear to be a more reasonable spot, though, the connections trained him up to this race. So, here he is — a very tough horse to judge given his experience. He doesn’t seem like he belongs here at all, but his connections are all respectable, so maybe they have been able to see something that we haven’t. Let’s be honest — until now we hadn’t seen anything about his horse because we had no reason to know he was even alive. 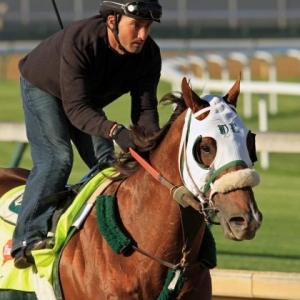 Last time out: Here’s how it typically happens with horses of Triple Crown caliber. They break their maiden — which means win their first race, typically against other non-winners — and then go into an allowance race or a low-level stakes. As they continue to succeed and improve, they climb the ladder into tougher races. Here’s what Tale of the Verve did — broke his maiden in his sixth try and then jumped into a Triple Crown race. Crazy — and not that kind of crazy that you respect. At least it was a nice win last time out, though. He took it easy at the back of the six-horse pack, moved five wide around the final turn and pulled away for a nice two-length lead. It was a nice run — but I didn’t watch and think that what he needed next was to tangle with American Pharoah. Prior experience: He started his career in Kentucky last fall, ran twice there, then headed to Louisiana for the winter before returning to Kentucky for that maiden win at Keeneland. He ran in five maiden special weight races before his win and had solid-but-not-exciting results — a second, two thirds, a fourth and a seventh. His three best results were in his three longest races, and his last two races were his best, so I guess you can say he is trending in the right direction. It’s hard to think of too many eventual superstars, though, who needed six tries to break their maiden. .
Trainer: Dallas Stewart was a long-time D. Wayne Lukas assistant but has been out on his own since 1985. He has had a good deal of success along the way. His most memorable win is probably with Lemons Forever in the Kentucky Oaks — the filly that paid $96.20 to win the 2006 race. He isn’t in the elite level of trainers, but he certainly knows what he is doing and is capable. He has only run in the Preakness three times, most notably finishing second to Big Brown in 2008 with Macho Again. He has had a heartbreaking couple of years, finishing second in the Kentucky Derby in both 2013 and 2014. Jockey: Joel Rosario, one of the top jockeys in the country these days, is looking to complete his career Triple Crown. He won the Kentucky Derby in 2013 with Orb and the Belmont last year with Tonalist. He has come close before in the Preakness — he was second on Ride On Curlin last year and was third and fourth in his other two career appearances. Needless to say, he knows how to ride and is an asset for this horse. He would need to have the ride of his life to get the win here, though. Breeding: This horse is a son of Tale of Ekati, who was owned by the same owner who owns and bred this horse. Tale of Ekati won the Wood Memorial, a key Kentucky Derby prep race, in 2008 before finishing fourth in the Derby and sixth in the Belmont that year. He was a solid runner who was very well-bred and was very capable of this distance. Tale of Verve is out of a mare called Verve, who is a daughter of Unbridled, a Derby winner. There isn’t a lot to knock about Tale of Verve’s breeding, and there is no reason to doubt that he will handle the distance easily — he has already won over the same distance. Get free picks from any of Doc’s Sports Advisory Board of expert handicappers – and with no obligation or credit card. You can use these free picks for any sport, and you will never deal with a salesman. Click here for your free Doc’s Sports picks.